Q: What is Batoto? / What does "Batoto" mean? Q: How does Batoto pay for the servers? Q: Reading on Batoto makes my eyes hurt because it’s too bright. Can I get something darker? Q: I want the old theme back, how can I get it? Q: How do I download a comic? Q: How do I edit the title of a topic I have created? Q: Can I delete my own topic(s)/post(s)? Q: How do I delete a comic chapter I uploaded? Q: Could you please delete the comment I made in this manga page? Q: Is there a Bookmark feature? Q: Can I view the the main page/releases only in a specific language? Q: Is there a way to get notification of new chapters of the manga I follow through email? Q: What is SPAM? How do you know if it's a spam post? Q: Forum features aren't working, what can I do? Q:I want the old theme back, how can I get it? A: Batoto gives you the option to change between three themes. Just go to the bottom left of any page on Batoto, find the option called Change Theme, right click on it and select the theme you like best. 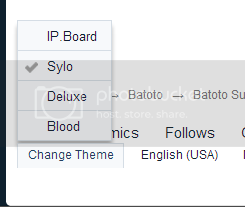 Please note that the theme "IP.Board" is not officially supported by Batoto. We cannot guarantee that the reader, forums and other parts of the site will function properly when using that theme. A: Batoto doesn’t offer a download option. You will have to go elsewhere for that for example to the homepage . The website of the scanlation group that works on the comic is a good place to start. You can usually find a link on the groups page on Batoto. Now you should have a field at the top which is for the title of the thread. A: Simple answer: No, you can't. Users deleting their own posts creates too much potential for abuse. Example: Somebody adding inappropriate content and deleting it quickly to avoid moderators while still getting attention from other users. Not being able to delete it should also, in theory, make users think twice about what they are posting and lead to higher quality posts. If you want one of your forum posts deleted you can use the 'Report' button found near the lower left corner of the post or thread and ask for it to be deleted. It will be taken care of by the moderating team. A: Rename the chapter title to "DELETE" then you unapprove the chapter. The renaming of the chapter title is important to avoid any misunderstandings and to make it clear that you want the chapter removed. Comments can now be edited (if you had typos or the like) and directly quoted just like forum posts. However, like forum posts, they cannot be deleted so if you accidentally posted the same comment more than once, refer to the link above. A: Batoto has a My Follows system that provides similar functionality as a Bookmarks feature. Log into your account and go to the follows list sorted by comic There you can see the last chapter read for each comic. Note: The new sign will disappear sometime after you opened the currently latest chapter. 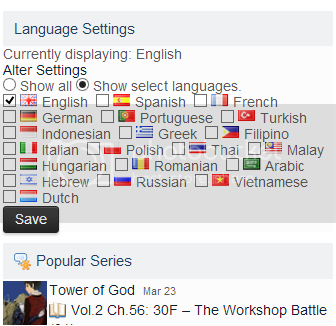 A: Users can now set their Global Language Filter. 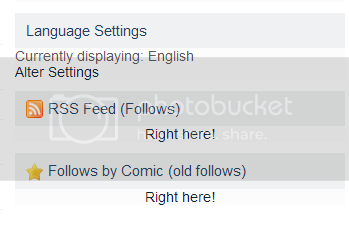 It allows you to view uploads only in the language/s you have selected in your options. or the right side of the Home page just above the popular titles list. The options are the same for the Home page and the My Follows page, and it will apply to all parts of the site. If the settings doesn’t work, clear your browser cookies and try setting them again. 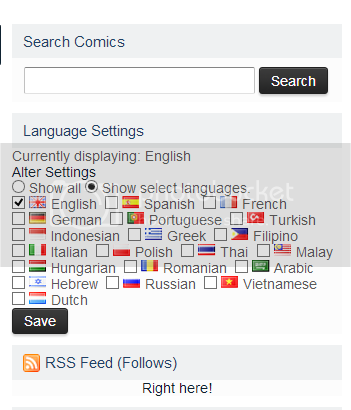 Alternatively you can use a RSS feed for updates of the comics that you follow. It can be found on your My Follows List. How you are notified will vary and depend on your RSS Reader. ...does not significantly add to the conversation. ...is used in excessive amounts. Anyone found spamming will be dealt with accordingly. 1)Clear your cache and/or cookies. If that doesn't work proceed with 2). 2) Disable all addons that you use with your browser. If the problem isn't solved proceed with 3). 4). If all of the above doesn't help make a new post in the Batoto Support forums and ask for assistance, but follow the guidelines. Edited by ROTFLMAOMAGNETS, 09 August 2016 - 08:44 PM. If all else fails, PM me. And use the REPORT button if you see any content that may violate site policy. Catch me on irc.idlechat.net (#seyrine) and D.F.T.B.A. !